Software for Industrial Freezing | Ferruh Erdoğdu, Ph. 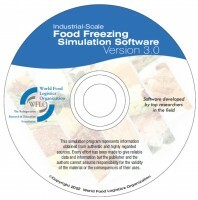 D.
Simulation of freezing and thawing of foods: `World Food Logistic Organization` states that “any company that cools, freezes, or tempers food products, or outsources these services, needs to know how long the process will take to estimate/calculate the enrgy costs, choosing freezing/thawing techniques, and preventng the temperature abuse”. In addition, calcualting the required correct time with all the required parameters (to solve the heat transfer phenomena behinf the process) can be laborious and time consuming. With this perspective, We (Drs. R. Paul Singh, Ferruh Erdogdu and Jattal Manapperuma) prepared this software package to address the widespread need for a straightforward method to determine the freezing/thawing times of food products. The software package was available from the `World Food Logistic Organization`, and Version 3.0 was released in 2002, and the last version was released more than 5 years ago.